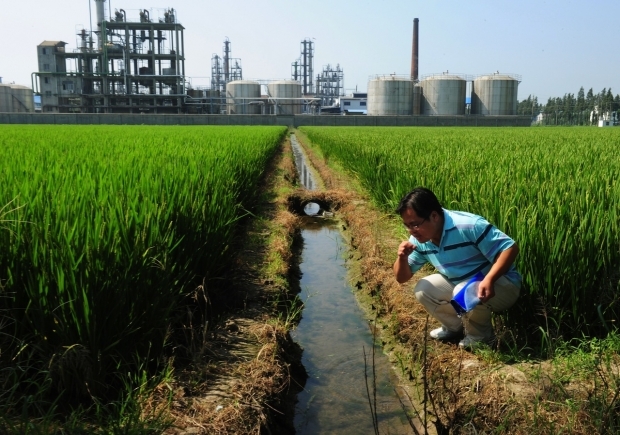 Environmental activist Wu Lihong checks the water quality in an irrigation channel outside a chemical factory beside a rice paddy and on the edge of Taihu Lake in Yixing in Jiangsu Province—September 14, 2011. By Beijing-based reporter Wang Yue. This article was first published by chinadialogue. Almost one-fifth of China’s arable land is polluted to various degrees, according to a national soil quality report on April 17. The report, based on seven-years’ worth of tests on 6.3 million square kilometers (2.4 million square miles) of land, also found that sixteen percent of the country’s soil is contaminated, with one percent heavily polluted. According to the report, major pollutants found in the country’s farmland include heavy metals such as cadmium and arsenic as well as organic pollutants associated with widespread pesticide use. Beijing has previously refused to disclose details of the country’s soil pollution data, saying in April 2013 that the statistics were a "state secret." Its decision to make the information public comes at a time of rising public fears over the potential impacts of environmental degradation, including health effects. Recent food safety scandals, including the discovery of cadmium-tainted rice, have triggered public outcries. According to the survey, China’s southern parts, home to major rice production sites, are more polluted than northern provinces. Acidic soil conditions of parts of southern China have led to higher risks of heavy metal soil pollution, Pan Genxing, a researcher at Nanjing Agricultural University, wrote in an email to chinadialogue in March. About 3.3 million hectares (8.3 million acres) of the country’s arable land—2.4 percent of the total—is too degraded for farming, Vice Minister of Land and Resources Wang Shiyuan admitted last year. The plan to treat soil pollution includes listing special protection zones and drafting a soil protection law, with an initial version already completed, says the report. Chen Nengchang, a researcher at the Guangzhou Institute of Geochemistry has said that new legislation is crucial to remediation efforts.